The New Ross Family Resource Centre is pleased to offer early education to children between the ages of two and one half to five years. Our program features a variety of play-based activities to promote social engagement and learning at many levels. Some examples of these include arts and crafts, dramatic movement and music, play to enhance gross and fine motor movement and control, and weekly themes. 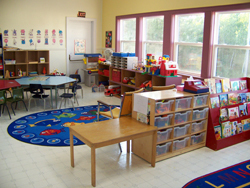 Our preschool program is designed to provide your child with a loving and nurturing environment that fosters exploration, risk-taking in learning, socialization skills, and beginning literacy and numeracy skills. For more information or to sign your child up to this wonderful program phone: (902) 689-2414.